While Kemco has been developing and publishing games for almost forty years, the past decade has seen their efforts focused almost exclusively on mobile platforms. 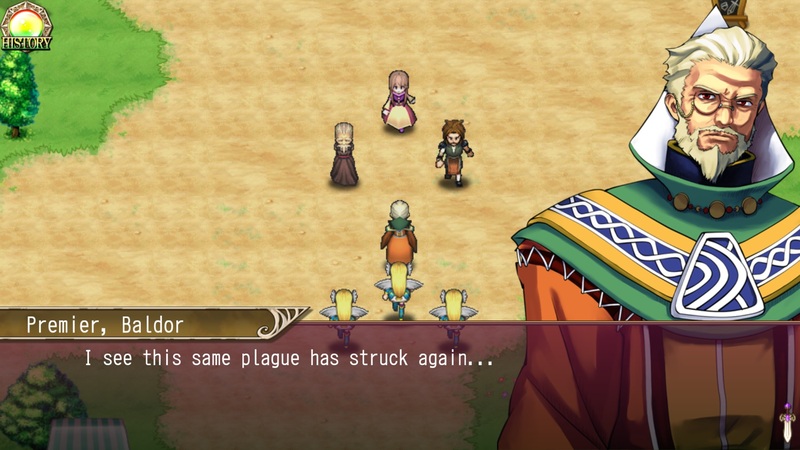 With a concentration towards visual novels and RPGs, Kemco’s desire to grow gaming beyond traditional consoles and handhelds has been persistent to the point that only recently many of their games have finally made appearances as ports on Steam and console eShops. One of their more successful titles that has seen such a release across the current platforms is Revenant Saga. 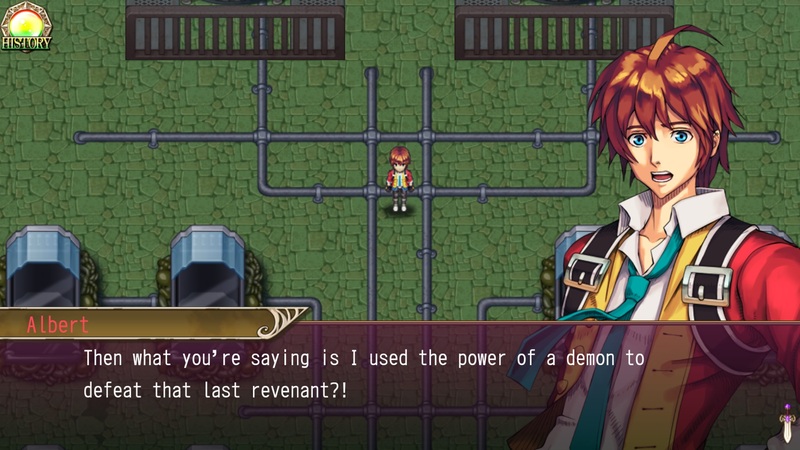 Revenant Saga tells the story of a war between humans and the demon possessed, called Revenants. Revenants are immortal and cannot be killed by normal means. Only Valkyries, those individuals who have been chosen by their god Rystoria and have received both a divine vision and an Amulet, can vanquish Revenants. However, this story is far more than just man versus monster, as a sinister group of individuals preside over the unfolding events. Capable of summoning demons for the creation of Revenants, these evildoers continue to unleash terror, but for what reasons? Dr. Moreau is one of these individuals whose actions set our story in motion, as he attempts to transform our hero, Albert, into a Revenant. The process is partially successful, as Albert becomes a Revenant, but is not fully possessed and manages to retain his own soul while also gaining the ability to wield his demon’s power. Albert, along with the demon Magnus with whom he’s sharing his body, Esther the Revenant Hunter, Bruno of the Rystorian Order, and Julia, who is shrouded in her own set of mysteries, set off into the world to hunt down Moreau and his associates from carrying out their wicked intentions. As with many JRPGs, Revenant Saga is a story driven campaign that begins with introducing our heroes and the several mysteries they will face throughout their journey. Most of the story is told through dialogue between Albert and his companions as they share their observations and opinions on the many questions and conflicts they encounter. In terms of story, Revenant Saga succeeds in telling a fairly intriguing tale with several surprises along the way. The plot is solid, in that it successfully manages to remain interesting throughout the course of the game. While some of the plot may be predictable, there is more than enough uniqueness, in terms of the questions posed, to capture and hold one’s attention. Unfortunately, the mysteries and the intrigue they bring are the limits to the immersion anyone will have. The story lacks emotional depth and, as a result, loses any chance of producing any impassioned immersion for players. I also took issue with the writers’ habit of rushing to introduce new plot twists, only to conclude them far too quickly. I assume this was an attempt to break the strict linearity of the story, however, the effort feels painfully rushed. For example, there is a point when Julia leaves your party, but after a quick dungeon and two boss battles, everything is back to normal again, as if nothing ever happened. These rapid-fire twists were over as soon as they started and I would have preferred much more length, depth, and a proper conclusion to them. This over-quickness to wrap up plot points extends beyond these twists, as several major storylines were also concluded far too quickly, especially with the buildup and the assumed extended time that passed between points. These resolutions, with their hurried feel, are unsatisfying and underwhelming, contrasting heavily with the attention-holding mysteries the main plot is able to provide. The journeys were pleasurable, but the closure doesn’t do them justice. As for storytelling, the dialogue between main characters is satisfactory, in that the feelings and intentions of the characters shine through and players will unmistakably know what our heroes are experiencing. There is some depth here, in that individual personalities are revealed through reactions to others’ comments and jokes, as well as events unfolding. I was especially pleased with Esther’s character, as I found her personality the most developed and unique amongst our heroes. Unfortunately, this level of quality is inconsistent, as I found the personalities and depth of Albert and Bruno to be generic and a bit lacking. Albert came off as a typical hero who wants to do good and becomes happy with happy things and sad when sad things happen, while Bruno is your typical brooding, quiet guy whose passiveness hides his compassionate side. We’ve seen this all before, and this is where more depth and emotion would have been appreciated to further distinguish these characters as individuals instead of fitting a mold. Fortunately, despite these and its other missteps previously mentioned, Revenant Saga still manages to provide enough quality to produce a convincing plot, characters we come to care about, and an overall enjoyable story. As with most games in this genre, Revenant Saga’s gameplay features familiar RPG elements along with several distinct mechanics that make the experience noteworthy. The majority of gameplay is combat driven, utilizing a turn-based system with random encounter battles. Once battle begins, players can either Attack, or choose Command, which opens four additional options: Guard, Item, Skill, and Transform. Guard reduces damage from enemy attacks for a turn and Item allows for the use of restoratives and stat affecting stock. 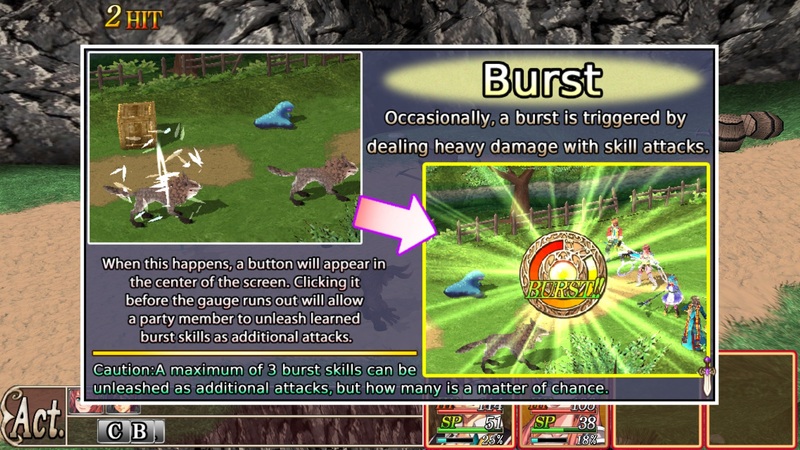 Skill opens the list of various special abilities a character can learn and use over the course of the game. They can have either physical or magical properties, as well as possess additional capabilities, such as hitting multiple enemies, stealing drop items, or inflicting stat ailments like poison or fatigue. Then there’s the Transform ability. Transforming is the most memorable aspect of combat and carries its own risks and rewards. Transforming boosts all stats and is also required to perform certain skills. When transformed, a character cannot recover HP nor can they be revived if their HP reaches zero. 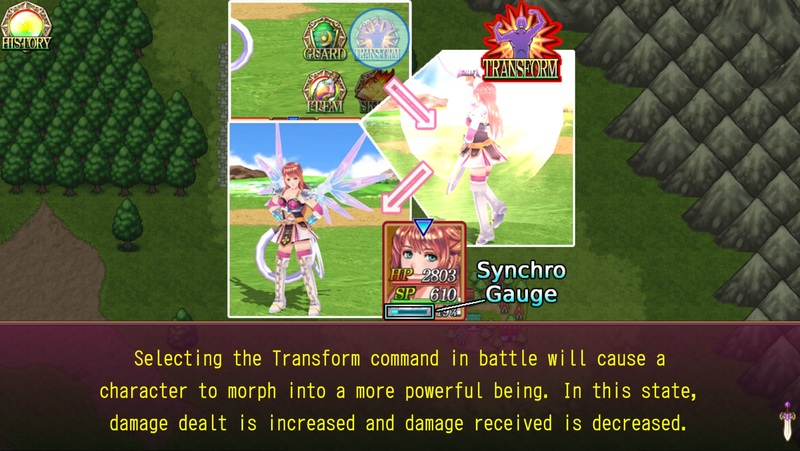 There is also a transformation gauge that increases as actions are performed. As the gauge increases, so does the power of the transformation, yet if it gets too high, your character can become uncontrollable and act on their own. Fortunately, many of these setbacks can be avoided by transforming back to normal and recovering as necessary. Knowing when to transform and for how long can make all the difference in battle. Several other factors can influence combat, such as the use of accessories and customizing your weapons, as well as the positioning of allies and enemies. Fortunately, in-game tutorials and the Help section in the Main Menu explain everything about gameplay, from battling to equipment, customization, earning experience, and using Revenant Saga Points (RSP) in the Menu Shop for rare items. It may seem overwhelming at first, but the game does an excellent job of introducing new facets of play at the appropriate time. In terms of its overall quality, gameplay is well executed. Combat is solid and easy to master. I appreciate all of the additional elements that can influence combat as well, as they keep it engaging and prevent it from becoming overly repetitive. I also appreciate the customization of weapons to give attacks additional effects, on top of the effects skills can inflict. The game encourages dealing the maximum damage, so stacking attributes and hunting for better items and equipment to cause that havoc becomes an enjoyable exercise. I am also impressed with the simplicity of the controls. I realize Revenant Saga was designed for touch platforms, but whether you are using a controller, keyboard and/or mouse, or touch, the overall simplicity is impressive and easy for anyone to learn. However, there are several setbacks to gameplay as well. For one, gameplay is as linear as the story, in that the entirety of the main quest follows the formula of visiting a town and clearing the nearby dungeon. Once the dungeon is cleared, you move onto the next pair of town and dungeon. Another issue I found is with the balance in difficulty. I noticed a precipitous difficulty spike about midgame, almost exactly the time at which you can afford to purchase experience boosting items from the Menu Shop. You become dependent on bonus experience to keep up with the drastic increase in enemy power. While I have no problem with the purchase or use of these items, I would have preferred a balance in which these items stayed optional and were only necessary for the mini-games and extras that call for leveling up into the high hundreds range. Finally, I would have liked more gameplay away from combat. While there are subquests scattered throughout the game, almost all require combat, whether it’s to procure a certain amount of items or defeat a specific number of enemies. Perhaps subquests that either develop subplots, further develop those plot twists, or take advantage of the underutilized sailing mechanism and vastness of the map could have alleviated the overuse of battle. As for the look and feel of the game, Revenant Saga’s aesthetic direction hearkens back to the times of classic RPGs, implementing a style that channels that pinnacle time for the genre. Visually, the design direction is a combination of 2D and 3D, in which character portraits are used during conversations, 16-bit styled sprite work and tilesets are used for the overworld, towns, and dungeons, while 3D models are used exclusively for battles. What I appreciate the most are these character portraits, as they are beautifully drawn and demonstrate the range of emotions our characters experience during their conversations. It also shows what the artists are fully capable of, and I wish I could have seen more design choices using this level of skill. Although I also appreciate the attempted nods back to classic RPG styling, the sprite work is somewhat bland. I give credit to the custom tilesets and sprites that were used, but more detail would have helped add more vividness to the world. The 3D work, however, is unimpressive. While I understand that this game was originally designed to run on mobile devices with limited hardware power, the 3D rendering gave the game a dated look and feel. This did not serve to evoke any type of throwback to the classics and has me questioning if any endeavors to improve the graphics quality were made when porting this to PC and consoles. Instead, I would have either liked to have seen more robust 3D renderings or incorporating that top-tier 2D artwork into combat. As for the audio, the execution is unremarkable. There are only a handful of tracks, and their melodies and placement in-game do nothing to compliment or emphasize the events on screen nor do they help the overall immersion. The tracks themselves sound generic, like they were written out of necessity, rather than composed to accentuate the visual or story tones the other aspects of the game may try to convey. Taken altogether, the aesthetic quality is hardly terrible by any means, but having seen flashes of the best the artists are capable of, a far greater effort is extremely desired. Revenant Saga manages to deliver many aspects we have come to expect from a JRPG. While it has its flaws, the game serves up more than enough high points to produce an experience that most fans of the genre will enjoy. With a ceiling price of about $10, the game is worth it to those who are looking for an adventure to gambol through, more so if a lower sale price can be had. With an appeal to tradition and the old school, Revenant Saga is definitely one to consider.